A US-based furniture manufacturing plant was experiencing problems with the system reliability of an industrial air conditioning (AC) unit. 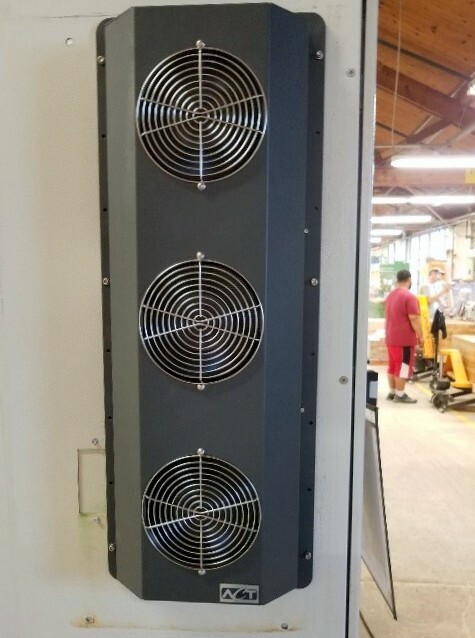 The AC unit was failing to provide essential cooling to an enclosure that housed programmable logic controllers (PLCs) and drives for computer numerical control (CNC) for wood cutting equipment. To add to the problem, the AC units were from an Italian manufacturer, which naturally created long lead times for spare parts and/or replacement units. The downtime created delays in production, as each CNC unit builds a particular component of a piece of furniture. This caused deliveries to be late and resulted in unhappy customers. To complicate matters, the operating conditions in the plant are dusty due to saw dust from the wood working. This challenge required the cooling system to be completely sealed – meaning that a cooling solution that allowed ambient, dusty factory air to flow directly through the enclosure was not suitable. The in-plant ambient temperatures fluctuated greatly depending on season, from 65° F in winter to 100°F in summer. The calculated thermal loads from the PLCs and CNCs were approximately 1,200 Watts. The plant facilities manager had found that the equipment had a tendency to trip out when temperatures exceeded 125°F. With the reliability issues, failures of the AC unit, and dusty and hot environmental conditions, the plant facilities team needed a better solution. The Thermal Management Experts at ACT visited the manufacturing plant to assess the problem. It was clear that the actual electrical component sizes and location of the enclosures would require an appropriate cooling solution. Typically, ACT works from the worst-case environmental temperature scenario to determine the proper solution. In this case, the hottest environmental temperatures occurred in summer. A scenario case was calculated with ACT’s Enclosure Cooling Selection Tool. The size, load, and unexposed side details of the enclosure were input to the Selection Tool. The maximum 25°F summer time temperature delta between the enclosure electronics and outside enclosure ambient temperature made it possible to offer an above-ambient cooling solution. 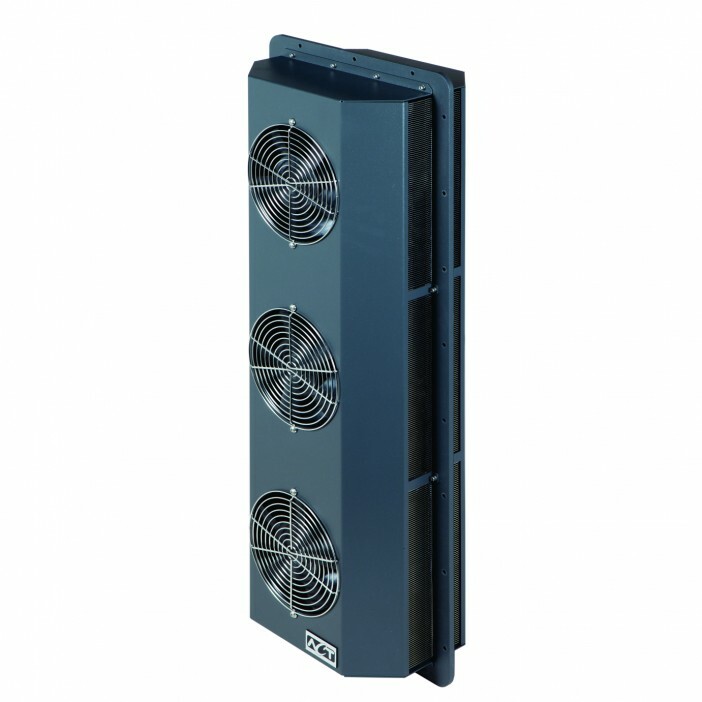 Above-ambient cooling solutions require the inside of the enclosure to be hotter than the outside of the enclosure. These conditions existed in this case, so the ACT heat exchanger could most optimally perform cooling by heat rejection. The selection tool calculation suggested an ACT-HSC-68 Heat Sink Cooler as the optimal solution. The ACT-HSC-68 is capable of cooling a 1,360 Watt internal enclosure heat load..
Based on the selection result and the on-site visit, the facilities team decided to move forward with ACT’s suggested solution. The successful installation first called for a custom plate to cover the existing AC unit cutout, and then a new mounting cutout made to fit the ACT-HSC-68 Heat Sink Cooler. The true test of the system arose in July 2018, when the plant encountered two weeks of summer heat, causing a 95-100°F plant working environment. The cabinet was fitted with a temperature monitor to measure the performance of the ACT-HSC-68. After the two weeks of peak summer heat, there were no drive system trips or faults due to overheating. The internal cabinet temperatures were kept under 100°F by the ACT-HSC-68 Heat Sink Cooler. There were three additional benefits to ACT’s cooling solution: one is availability to spare parts and new units from a US-based manufacturer (ACT is located in Lancaster, PA.); second, the price of the system was 40% that of an AC unit; and third, operating cost was reduced approximately $350 (AC unit operation cost of $400/year vs. the ACT-HSC-68 operation cost under $60/year). ACT supports the installation process with technical installation videos and dedicated engineering files in both CAD and SolidWorks STEP formats. The Thermal Management Experts at ACT are always ready to discuss your application. Contact ACT today to or use our online selection tool for hassle-free Enclosure Cooler online ordering.